Most of Japanese learners, probably get into a panic over tons of numbers of Kanji. That is so same with even Japanese. With the passing of the years, the rough illustrations turned into more lines or dots, and they finally got to be shaped into current form around two thousand years ago. It is impossible to count it down exactly how many numbers Kanji are, however it is often listed 2,000 of those as in frequent use. Well, you always wondering how to defeat your tough enemy (I mean Kanji of course).No worry, you’ll have already started the journey of Kanji-master after 5 minute-reading. First one is 『男』, means “man” and is pronounced “otoko” in Japanese. As in the picture, a man uses his powerful strength to pull a plough across the extensive rice field. In old the time, it was a mainly man to be engaged in agriculture. Who needs a tractor? 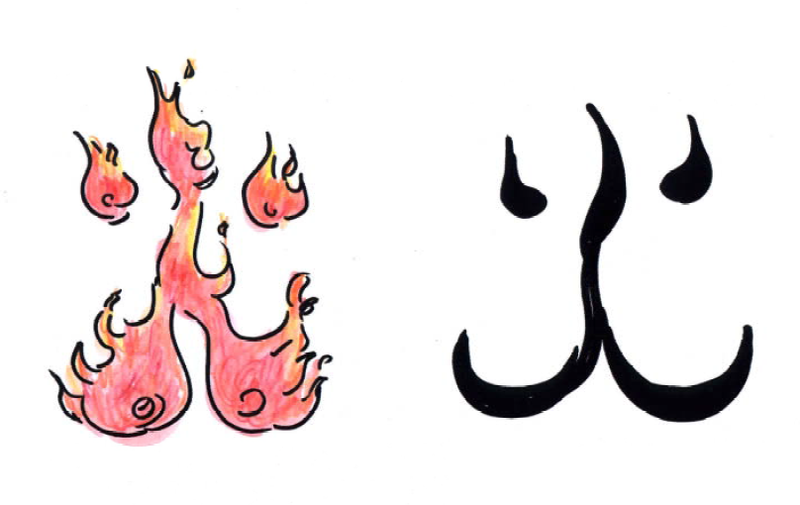 『火』is the second one to be introduced, meaning “fire” and is pronounced “hi” in Japanese. It is just simply expressing the situation of the flames leaping from the fierce fire. 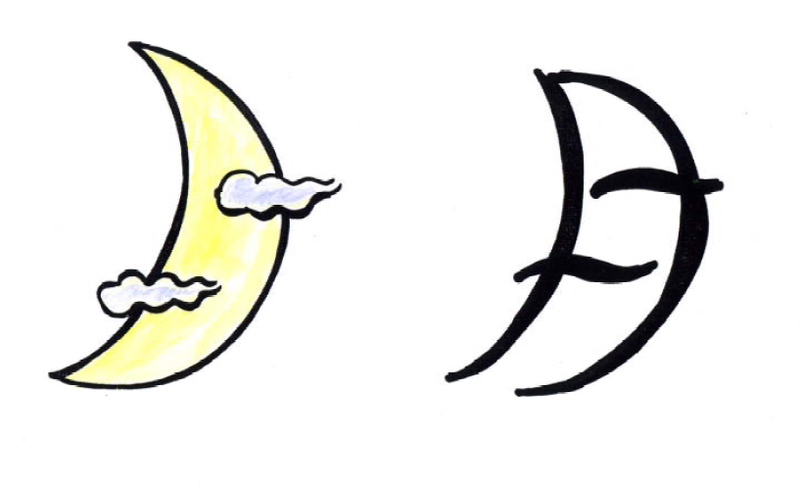 In the third, let me introduce about 『月』.It means “moon” and is pronounced “tsuki” in Japanese.People of long ago drew the view, two clouds drifting past the moon. 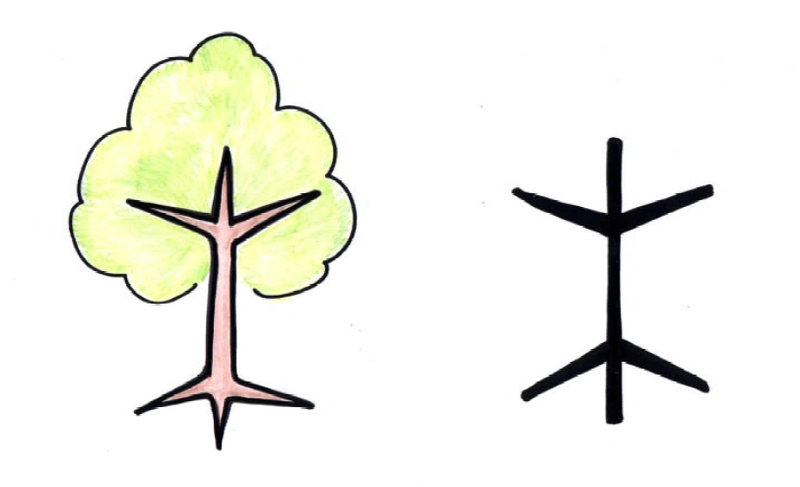 Number four, I would like to introduce about 『木』, means “tree” and is pronounced “ki” in Japanese. You can see the figure of a tree filled with fully fresh green leaves in the picture right down. 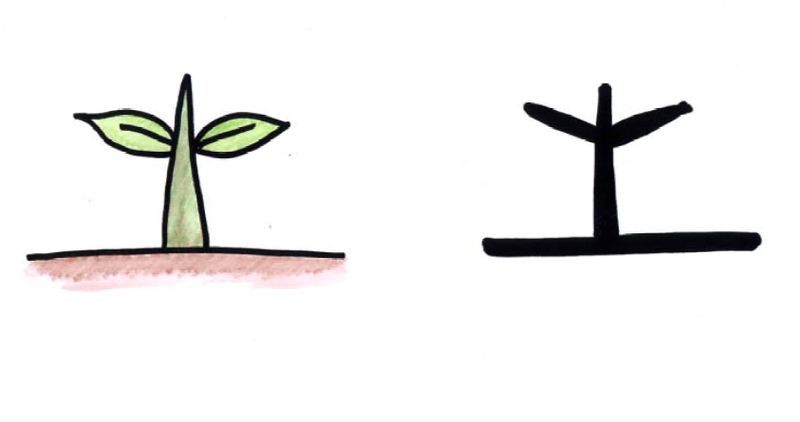 Fifth one is 『土』, means “ground” and is pronounced “tsuchi” in Japanese. In earlier times, farmers were trying to develop their fields to be rich in order to plenty harvest. The illustration must be come from their hoping to the ground. Number six, I would like to introduce about 『中』, means “middle” and is pronounced “naka” in Japanese. 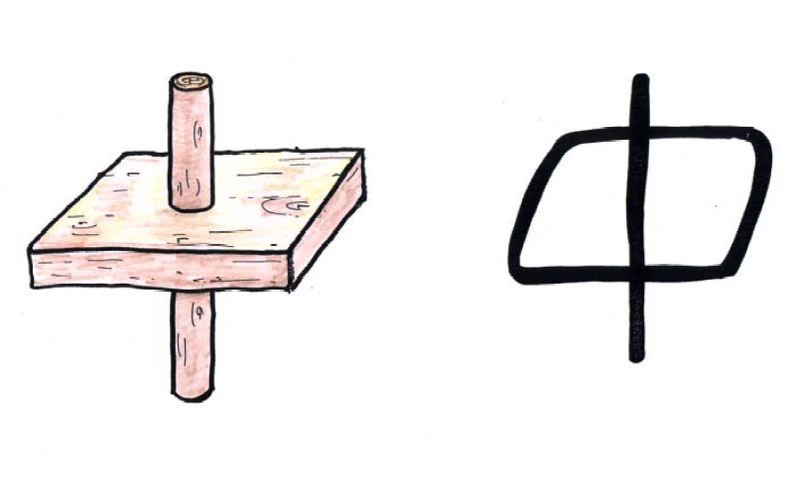 This is showing the situation, hammer a stake through the middle of the block. The very finally, let me introduce about 『目』, means “eye” and is pronounced “me” in Japanese. 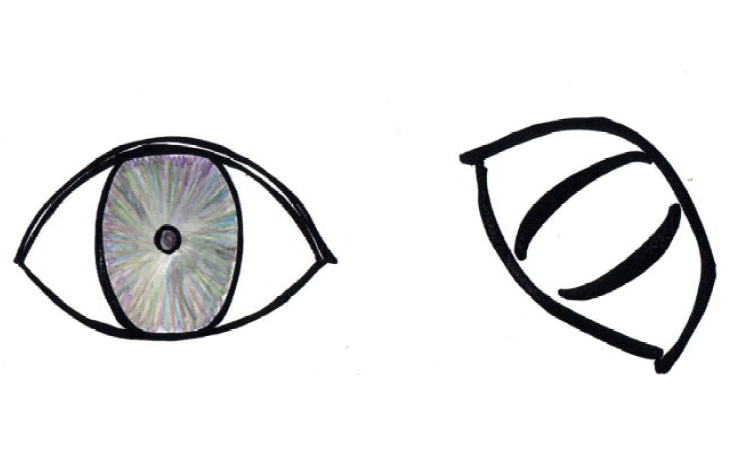 You already found that it is just expressing big, staring eye. Now, you are fascinated by this incredibly sophisticated language, Kanji. 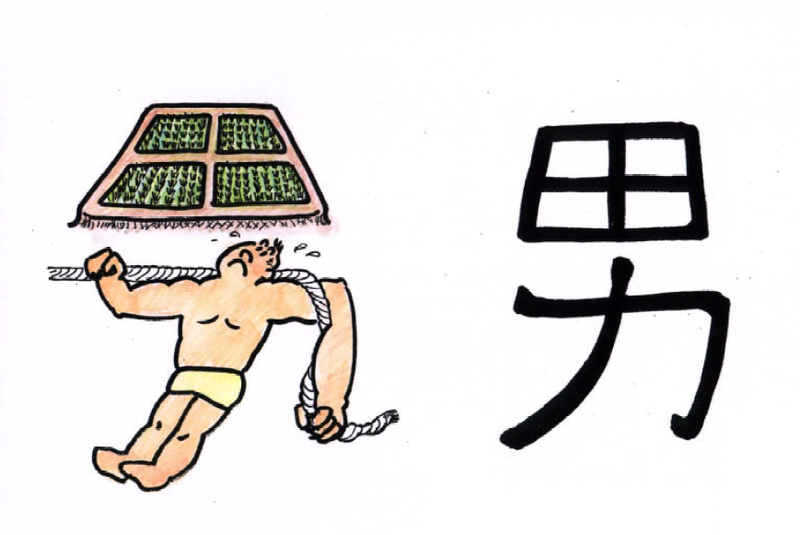 More and more you understand the meaning of the background, Kanji is far and far away from something unknown, complicated, and difficult.Hang in there! You already found the way to enjoy learning Kanji! *If you need some effective supports with Kanji, let us help you! Cosmos Japanese Language School is always welcoming!! !